Nikon S-Kt illumination system, base removed. 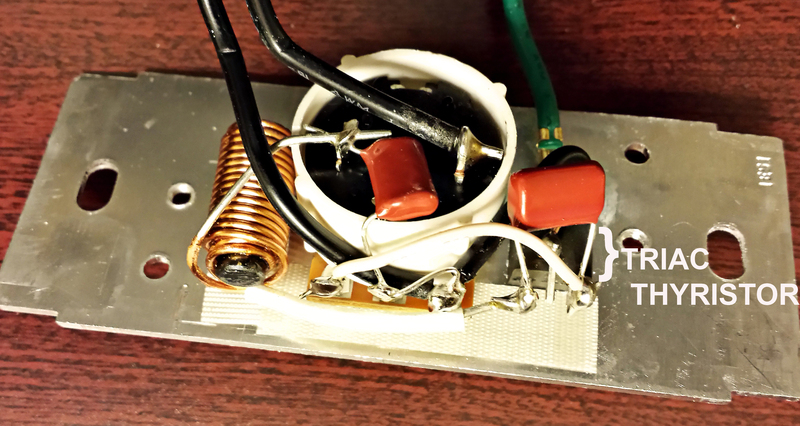 Note old-style “toroidal” transformer at bottom and voltage adjusting potentiometer at upper left. The toroidal design is actually highly efficient and shows less power loss than square designs. The thyristor (Triac) is the pillbox-sized rectangular structure at upper right. 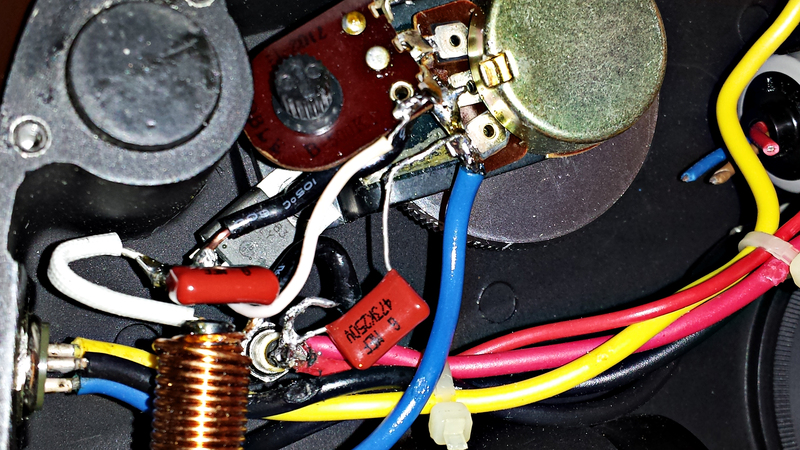 Someone has improperly rewired the potentiometer at upper left – note bare wires! Restoring my beautiful old Nikon S proved to be a continuing saga – and a remarkable learning experience. In my last article, I described the procedure for replacing a broken nylon fine focus spur gear, a problem that has sidelined many of these finely-crafted old scopes. I originally bought the Model S-Kt with lenses (in lovely shape from 20 years on a shelf) for only $75.oo because the light would not turn on. Getting the light working took only ten minutes with a soldering iron to re-secure a loose flange on the light bulb, after which the bulb connected properly. However, deeper problems lurked within. 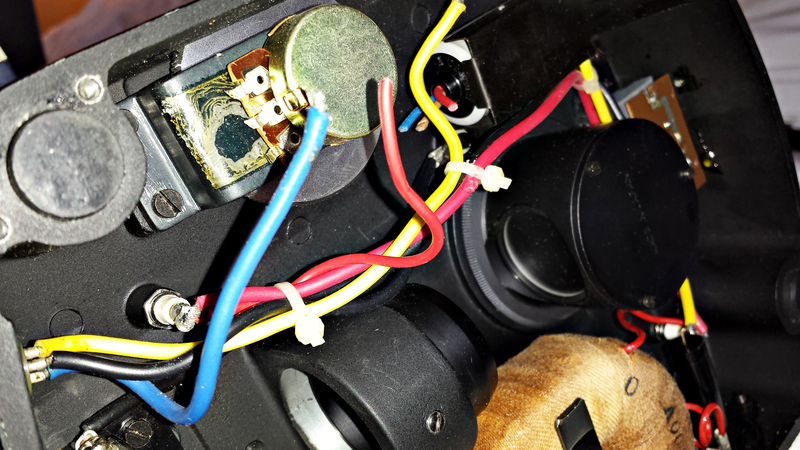 After repairing the focus gear and bulb, using the newly-restored scope revealed that the bulb voltage could not be raised over two volts and the transformer was overheating and smelling hot. It was unclear whether the transformer was shorted or the electronics were not working. This question was solved when, after half an hour of operation, the light suddenly flared to its full brightness and the intensity control stopped working. Clearly, the transformer was producing full voltage, but the 45 year old electronics had blown. Removing the baseplate revealed homemade circuits on the intensity control potentiometer; these may have contributed to the overheating and failure of the old circuits. I knew nothing of light control circuits, but online research informed me that the core of a light dimmer system was something called a thyristor. 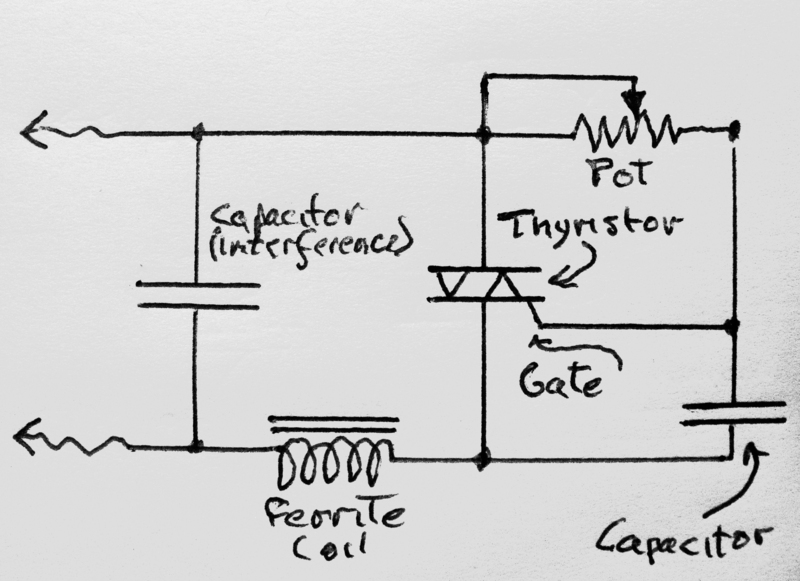 So what is a thyristor, and what are those mysterious little thingamagummies on the printed circuits inside the base of any but the oldest microscope power supplies? I had to educate myself in the history of microscope illumination, and it turned out to be a fascinating journey. clunky, and much too large to fit into a microscope base – but they are also simple, sturdy, and almost indestructible under normal conditions. And when one did (rarely) short out, you tossed it into the trash, bought a new one, plugged it into the scope, and went on with your day. The insides of the microscope contained a bulb, a mirror and sometimes a few lenses, but little else. With the exception of dirty contacts or broken cables, these simple systems could be expected to function reliably fifty years after they were first turned on. As microscopes became more streamlined, power supplies moved into the base of the scope and incorporated newer, more compact electronic control systems made possible by the advent of solid-state electronic devices. Controlling electric current electronically is not a new idea. In 1906, Lee De Forest invented the “Audion”, the first functional vacuum tube; this design and its basic theory was later improved by Fleming. Electrons boiled off a hot filament flowed to a positively-charged second electrode (the “plate”). A small negative voltage applied to a thin mesh (the “grid”) inserted between the filament and the plate could control this relatively large current, thus allowing the tube to be used as an amplifier and heralding the beginning of electronic communications and controls (see De Forest’s original Scientific American article: http://earlyradiohistory.us/1907aud.htm). However, vacuum tubes were fragile and wasted large amounts of power to heat filaments. mobile positive charges. In this way, the transistor, employing the base current like the grid of a vacuum tube, can perform the same functions as the vacuum tube, but with less weight, much less power consumption, lower voltages, and much smaller size. With choice of physical configuration and semiconductor material, as well as “doping” (addition of trace elements to the semiconductor material), an almost infinite variety of functions can be designed into semiconductors. 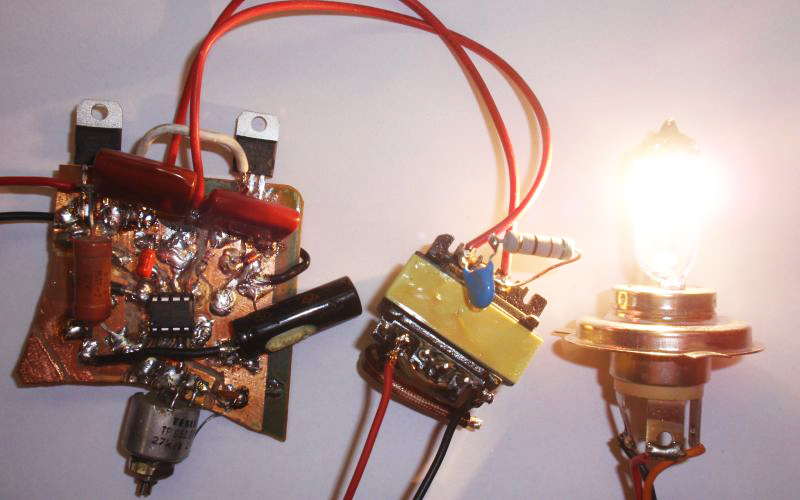 Simple Triac Dimmer. 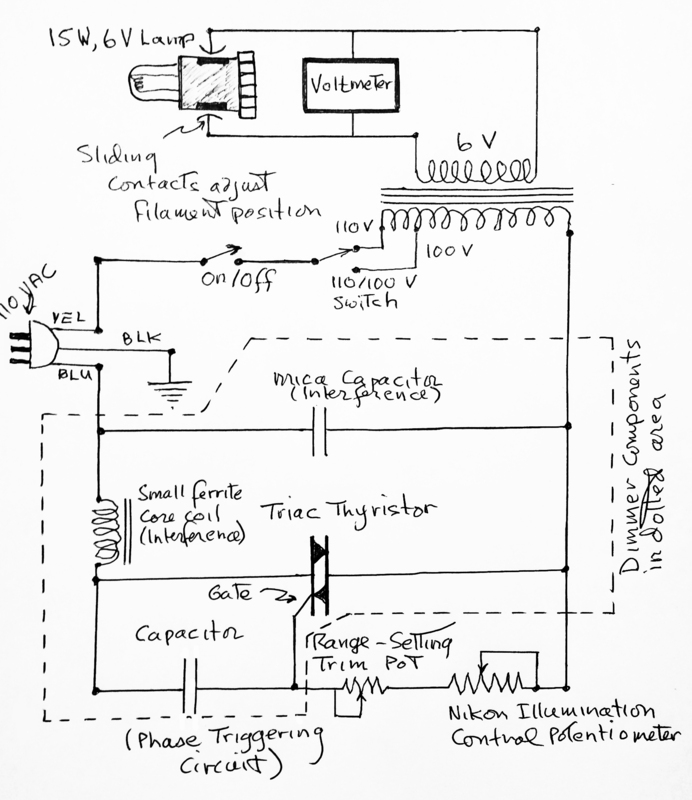 Capacitor helps control phase of gating current. This circuit also demonstrates the simple concept of the basic incandescent dimmer, with the AC supply, the light bulb, and the triac dimmer wired in a simple series circuit. For a low voltage bulb, the primary of the bulb transformer can be placed where the bulb is in the circuit. 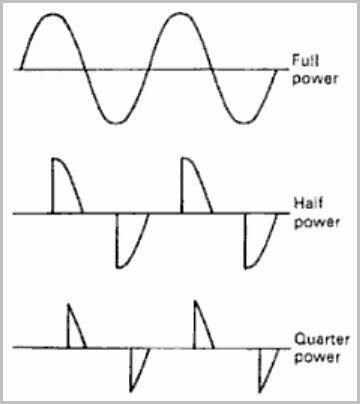 Essentially, the triac acts as a switch, cutting out increasingly large chunks of the AC supply’s sine wave as the gating current and phase are altered by the resistor/capacitor combination. Chopping out pieces of the alternating current reduces the effective supplied power: This system works well for incandescent lights, where the filament stays hot between pulses, effectively smoothing out any flicker in the illumination. So how does one replace a 45-year old thyristor that belongs in a museum??? Excellent older microscopes (and many expensive and not-so-old models) are often sidelined because of failing electronic components and unavailable parts. This was becoming a thorny problem until Amateur Microscopy friends contributed ideas, and Mark Morris, who has been fixing these microscopes since I was in elementary school, gave me the key idea. Circuit for the Leviton dimmer. 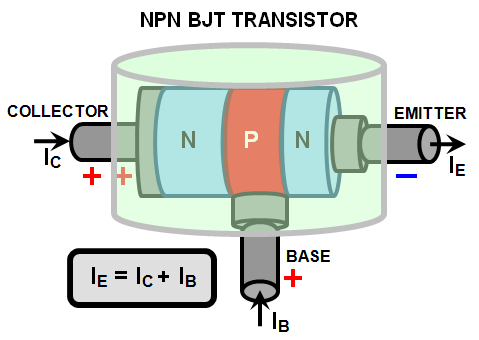 The potentiomer, thyristor, and capacitor comprise the basic control circuit. 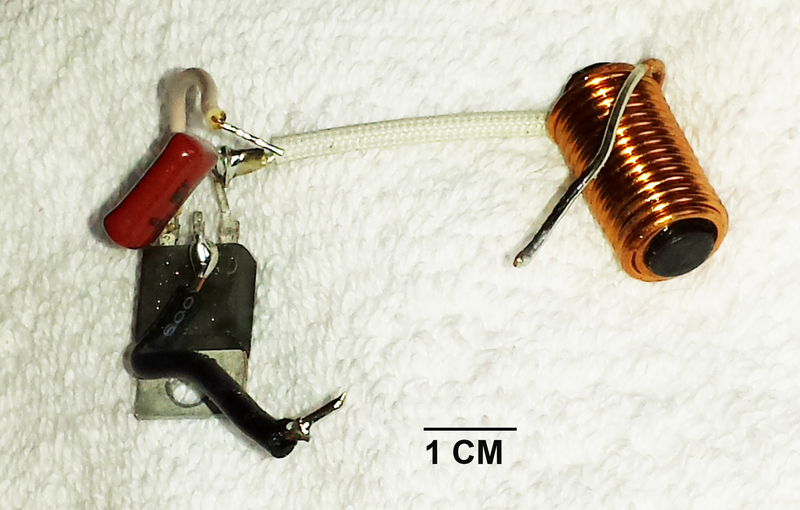 Some components of the Dimmer – thyristor, small ferrite core inductor (coil), and capacitor. 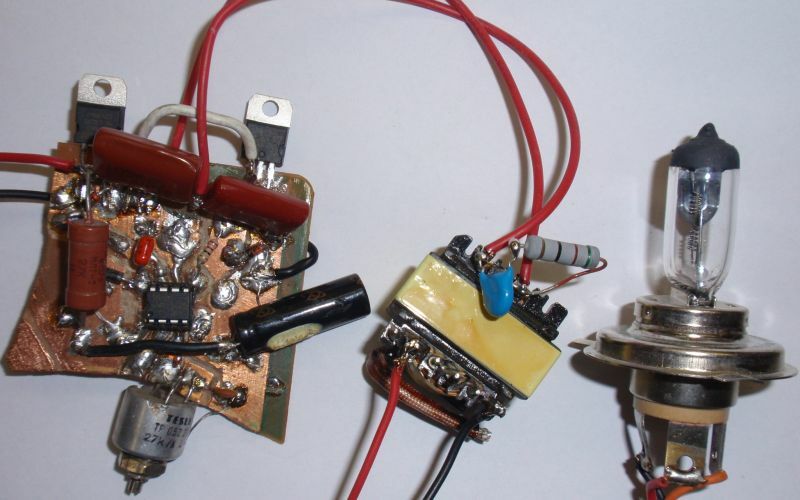 controller was very similar and equally basic, but the 1970 thyristor’s volume was around 100 times greater than that of the tiny chip removed from the modern dimmer. Nikon Intensity control potentiometer, all other components removed. Dimmer components installed on Nikon potentiometer. Heat sink on the thyristor, the barely-visible black chip, is secured under one potentiometer mounting screw. 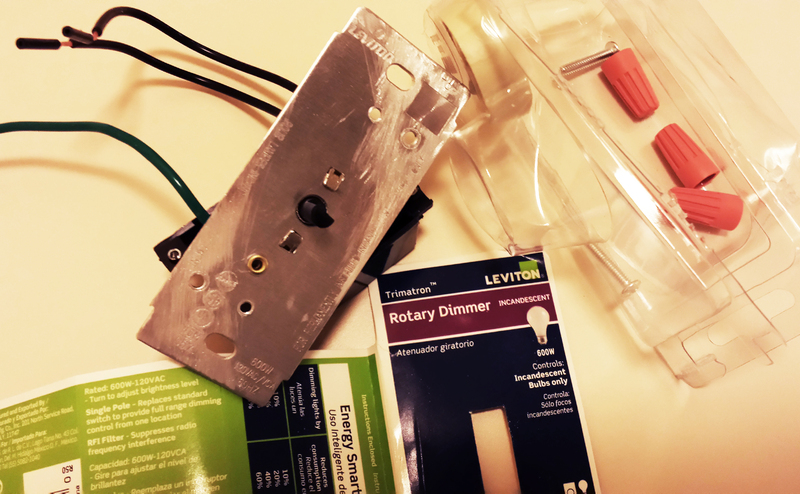 One of the problems with this “transplant” was that the Nikon potentiometer had a resistance value of 100K ohms stamped on one side, but the resistance of the Leviton dimmer potentiometer and the trim pot were unknown; this introduced a degree of guesswork into matching the two systems. When this configuration was tested, the Nikon bulb would only dim partially. Clearly, the amount of resistance provided by the Nikon potentiometer was less than the dimmer circuit was designed for. Completed control system. 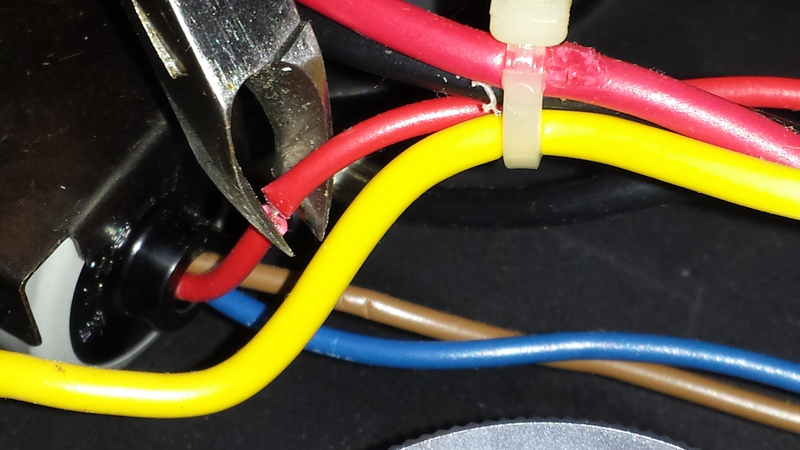 Range-setting trimmer pot soldered to left of main illumination potentiometer. 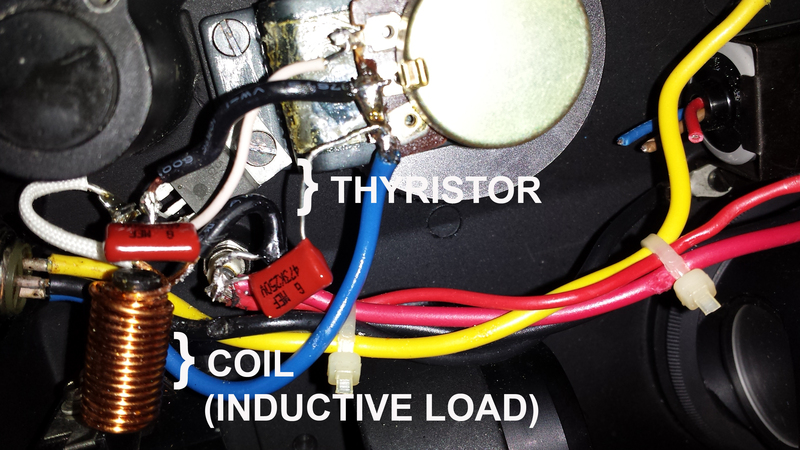 Tiny modern thyristor barely visible below the trim potentiometer. Final Nikon S illumination control circuit. Dotted line surrounds components transplanted from the dimmer switch. This simple fix should work with older, 60Hz illumination control systems based around a simple power control circuit and a transformer. 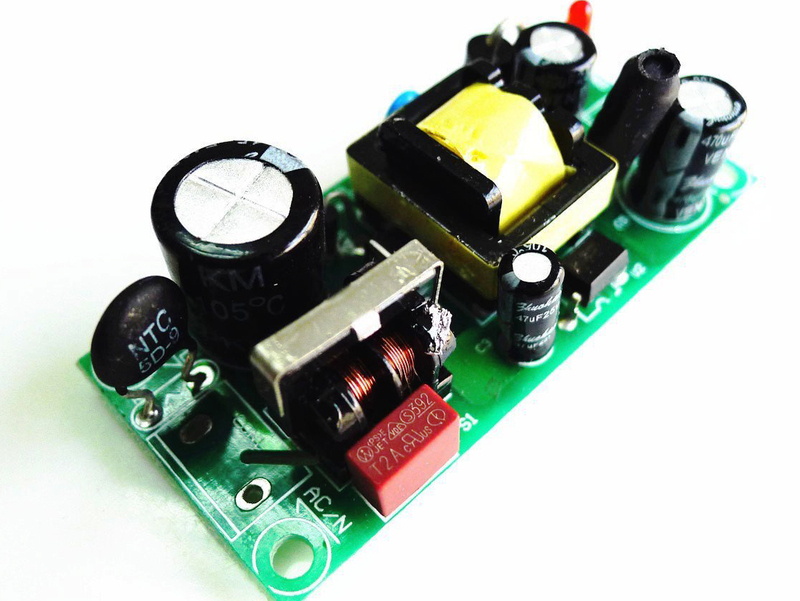 It could also be used to replace a missing or non-functioning external transformer system: a dimmer switch and a 6 volt doorbell transformer in a small electronic case, with appropriate cords and plugs, could form a cheap and simple microscope light power supply. One could add a voltmeter and a little panel light to make it fancy. Next: Part II with some thoughts on repairing more modern systems as well as LED conversions, plus references.